The incidence of malignant melanoma, a highly metastatic form of cancer, is increasing globally at a dramatic rate. Due to limited therapeutic options for patients with late-stage melanoma, innovative treatment regimens are desperately needed. The A2058 cell line was established from a lymph node metastasis of a 43-year-old male patient with malignant melanoma. PCTAIRE1/CDK16/PCTK1 plays an invaluable role in cancer cell proliferation and is overexpressed in various human tumors, including malignant melanomas. A 2016 study by Yanagi et al. published in Molecular Therapy-Nucleic Acids investigated the in vivo therapeutic potential of treatment with PCTAIRE1 siRNA-lipid nanoparticles using the A2058 xenograft model of human melanoma. 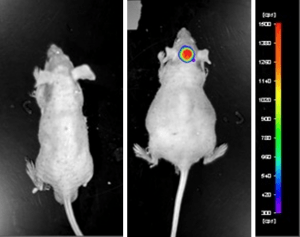 These findings indicate that siRNA treatment targeting PCTAIRE1 is effective in vivo and suggest that PCTAIRE1 siRNA-lipid nanoparticles could be a new therapeutic approach for melanoma patients. A 2012 study by Tian et al. used the A2058 cell model to evaluate a series of spirooxindole derivatives (SOID 1-12) and their effects on melanoma, a disease that is often refractory to available chemotherapies. Results demonstrated that SOID-8 decreased STAT3 and JAK2 phosphorylation, ultimately resulting in apoptosis induction and in vivo tumor growth suppression. In 2011, Rozenberg et al. released a study evaluating metastases in orthotopic murine skin cancer models, including the A2058 xenograft model. Ultimately they concluded data supported a model of melanoma metastasis where ERK activation and epidermal-to-mesenchymal (EMT) transition may facilitate metastasis but may not be a prerequisite as previously believed. Finally, a study by Hoeflich et al. (2011) used the A2058 model to evaluate a novel MEK and PI3K inhibition combination therapy. They used GDC-0973 (MEK inhibitor) and GDC-0941 (PI3K inhibitor); results showed that continuous combination exposure was not required and that intermittent dosing was just as effective. The CDX (Cell Line Derived Xenograft) A2058 xenograft mouse model is created from the A2058 cell line (human melanoma). This cell line can be utilized for in vivo melanoma therapeutic studies specific for increased pERK and pAKT status. 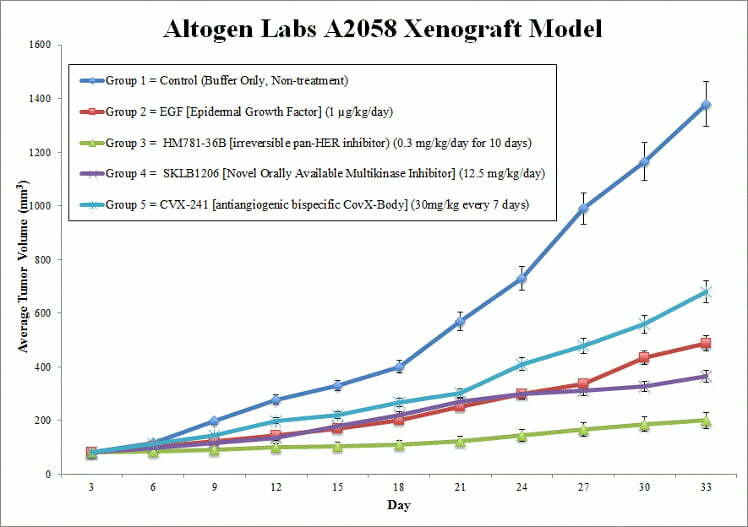 The A2058 cells are cultured under conditions of exponential growth prior to injection. The cells are trypsinized and, using a trypan blue exclusion assay, viable cell counts are determined (98% cell viability required). The cell suspension is then adjusted to the appropriate density needed for inoculation. The mice (athymic BALB/c nu/nu, ~8 weeks old) receive the subcutaneous injection into the flank of the hind leg. The injection contains one million cells (in a volume of 100µL) of the Matrigel A2058 cell suspension. Injection sites are palpated up to three times weekly until tumors are established. The tumors are measured using digital calipers and monitored until they reach 50-150 mm3. Mouse weights are recorded 2-3 times weekly and tumors are measured daily. The animals are euthanized at the experimental determined limit or when tumor size reaches 2,000 mm3 or size determined by approved IACUC protocol. Necropsy and tissue collection is performed as defined for termination of experiment. The tumors are excised from the animals, weighed and then documented by digital imaging. Gross necropsies are performed and customer specified tissues are collected for downstream analysis. Tumors or tissues can be snap frozen in LN2, stabilized in RNAlater or prepared for histology.